Posted November 9, 2016 by Bailey Heard & filed under Blog, FeaturedOnHomePage. Hello! It’s been fast and furious these days in the Heard household. 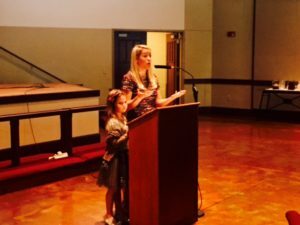 I spoke locally to a Mothers of Pre-schooler (MOPS) group last Friday, at a cancer survivors’ lunch for Head for the Cure on Saturday, and I just got back from speaking in Austin, Texas to LifeMoms at LifeAustin Church. I’m looking forward to heading to Katy, Texas to speak at Kingsland Baptist Church on Thursday, then flying to Atlanta, Georgia next week to speak at a Keller Williams Inspirational brunch, and then straight to Carlsbad, California to speak at another Keller Williams Inspirational brunch. I’m enjoying every second of being busy doing what I love while bringing hope, inspiration, and encouragement to others. My absolute favorite part of speaking is when someone in the audience comes up to me after I speak because something I shared resonated with them. I feel honored when someone opens up and trusts me enough to share their pain with me. Often I get asked where my daughter, Ellie, stays when I travel. Thankfully, she is safe and happy with my family. It truly has taken a village to raise my sweet El and I’m thankful to be surrounded by my loving, helpful, and supportive family. 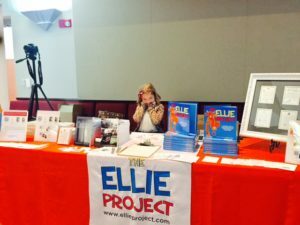 This weekend was the first time I’d taken Ellie with me to a speaking event. She came with me to the cancer survivors’ lunch. I hadn’t been sure if she could sit through my message and I was worried about how it might be for her emotionally to hear me share the stories about her Daddy. I asked my brother to help me out by coming to the event and sitting in the audience with Ellie in case she needed anything. She’d planned on having more to say to the audience, but she said she didn’t realize there were going to be so many people there. Together, Ellie and I conducted a drawing to share Andrew’s books and stationery with these inspiring men, women, and their families whom we felt an instant connection with because of the challenges they’ve faced as cancer survivors. On the car ride home from the event, Ellie told me the video made her sad. She said she really missed her Daddy. I told her it was OK to miss her Daddy. Overwhelmed by the emotion of the day, my daughter’s sadness, and missing Andrew, I wiped the tears from my eyes. Some moments are hard and it’s OK to give yourself permission to feel the pain. The pain will not consume you. Instead, it will pass through you if you allow yourself to sit with the discomfort. It’s normal to want to avoid the pain by putting a temporary band-aid on it. We all have our vices, however in my experience, the only way out is through. I realized after Andrew passed away that I wanted/needed help to learn how to process and work through my pain and grief, so I worked with a therapist, which I found extremely helpful and healing. For me, pain and grief has been like a roller coaster, never knowing which days and moments are going to trigger certain emotions. It’s something I’m learning to live with as it’s become a part of my everyday life. What’s helped is having the tools and knowledge to know what to do with the emotions when they come up, how to move through the pain in order to move forward with my life. So grateful for you. Thank you for spending time with me today. Love and Blessings. PS – If you have a group that would benefit from hearing my family’s journey, please shoot me an email at bailey@baileyheard.com.